You have certainly met people in the street, in the bus, in the metro… You don’t know who they are but at a certain moment you begin to talk. Recognizing musicians is very easy because of their instruments. That’s what happened few days ago. Making his European debut, guitarist Nadav Peled joins forces with fellow Israeli expat, saxophonist Maayan Smith for a hard swinging straight ahead project. 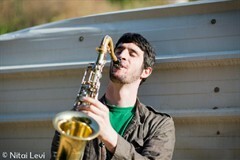 These two promising young Israeli expat musicians are steadily making a name for themselves in their respective scenes. Maayan in Brussels and Nadav in The Big Apple. I know that they play with some of the best rhythm section players on the Belgian scene because two days ago, I met a friend, Wim Eggermont, who is a fantastic drummer, and he told me that he was playing with them. Tonight, concert and jam session in Le Chat-Pitre at 8:30 pm (Rue Du Tabellion 1, 1050 Brussels). Do not miss it ! 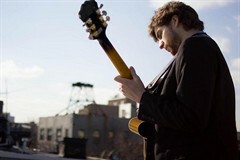 “Nadav Peled is one of the very finest young guitarists playing jazz I have heard in a long time.